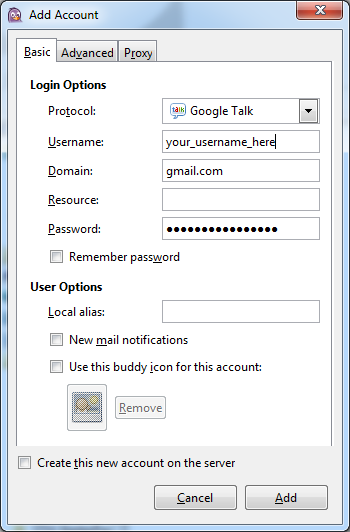 Many Gmail users also use Gchat to talk to their buddies. Why not – the Gchat window is right there, next to their emails and very easy to use. Problem is, Google automatically analyzes everything Gmail users are emailing or chatting about. 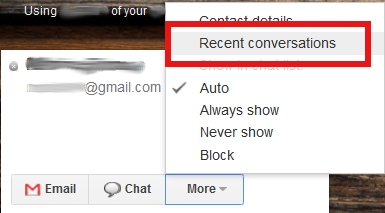 It’s obvious that Google stores your emails, but if you’re sceptical about how much of your chats Google records, just go to any of your Gchat contacts and click “More” -> “Recent Conversations”. You can now see the contents of all conversations you’ve had with this user. This should make it obvious that everything you type in Google Chat is recorded and stored. Why is Google recording our chats? But why do Google record all this? Because by knowing everything you talk about, Google can perfect your “behavioural profile”. The better this profile, the higher its market value. Remember, if you’re not paying for it, you’re not the customer, you are the product! And everything you say or do while logged on to Google services is used to make you a higher-yield product. Google then charges marketing companies (Google’s real customers) for access to this massive data set. Marketers are aching for an opportunity to directly target the more than 350 million Gmail users (as of Jan 2012) with personally targeted, customised ads. Of course this is done automatically with software, and Google is not the only “free services” provider to sell your data for profit. Facebook follow the same business model, and it appears to be working out quite well for them. Facebook recently reported $3.7 bn (yes, that is billions of US dollars) in revenues. There is a lot of money to be made for companies that turn our entire lives into sellable products. This is one of the two reasons you would want to stop Google recording your chats. The second reason why Google recording your chats is not a good idea is that Google hands over this information (your emails, chats, things you have searched for, YouTube videos you have watched) to the law enforcement agencies of your country. They have no choice – they have to. Google provides a “Transparency Report“, which is commendable. Unfortunately it falls short of giving us a clear view of just how much personal information has been handed over to government agencies due to the way the numbers are presented. “For how many user accounts was Google asked to hand over data to government agencies between January – June 2011”? You can look up your country by following any of the links in the table. Given just how much Google knows about us, our friends, and our friends’ friends, it is a troubling thought that all this data, all of our contacts, the videos we have been watching, our chat messages, things we +1’ed, services we use from other service providers (Flickr etc) are recorded by Google and therefore being handed over to government agencies all over the world at this unprecedented rate. If you believe that nothing you ever type or click on will be of interest to any law enforcement agency, government or court around the world until you and your entire family pass away (but what about your grandchildren? Think 40 years ahead. Could someone in 2052 dig up a record of an internal joke with one of your buddies back in 2012, cast it as proof of extremism and use it to harm your family? ), AND you subscribe to the “I have nothing to hide, therefore I have nothing to fear” camp, you can stop reading here. If you are genuinly uncomfortable with how your online life is harvested and recorded and wish to take steps to protect what little parts of it you can, read on. 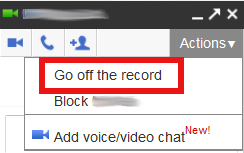 Google provide a mostly-hidden feature on their Gchat client that allows you to indicate you want to go “Off the record”. 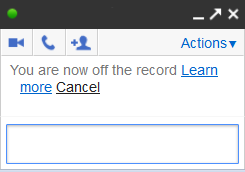 You can see it under the “Actions” menu when you are chatting with someone on Google Chat. Google say that going “Off the record” means that “Chats […] aren’t stored in your Gmail chat history…” which sounds good, but does not actually promise your chats are not being recorded. Given that Google “will share personal information with […] organizations […] outside of Google if […] preservation or disclosure of the information is reasonably necessary to meet any […] enforceable governmental request“, it is a safe assumption that Google Chat’s “Go off the record” option does not really buy you any privacy. We will use Free Software tools that allow you to be reasonably confident that Google is not recording what you say over chat. To have a private chat, both you and the person you wish to privately chat to, need to follow these steps. If you use multiple computers to chat (e.g. a work computer and a home laptop), you have to repeat these steps in every computer before you use it to chat. You will only have to “prepare” every computer once. Get the software from http://pidgin.im and install it on your computer. Done installing Pidgin? Great. Continue to the next step. 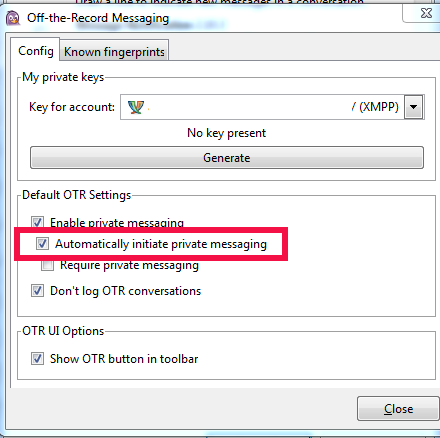 The Off The Record (OTR) plugin allows Pidgin users to encrypt their communications. Get it from http://www.cypherpunks.ca/otr/ and install it on your computer. Almost there! Now click on “Add” to complete setting up your account. If you see something like the above, congratulations – you are successfully connected to Google chat. You are using Google’s two-step authentication. In that case your “main” Google password is not accepted. You need to create an application-specific password for Pidgin on the computer you’re currently setting up. Why? 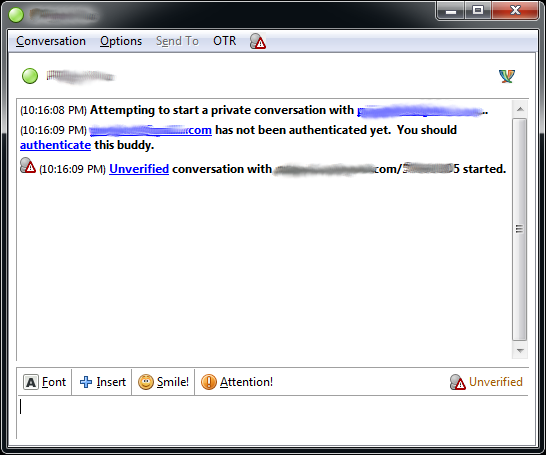 Your (corporate or national) network firewall is blocking the chat protocol XMPP. It may be possible to bypass it with Tor. Congratulations! 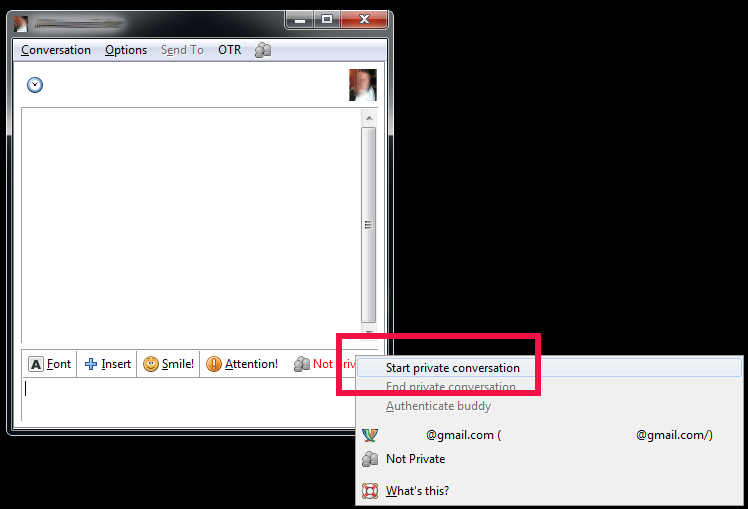 You can now chat privately with buddies who also use the OTR plugin. You have just made it very difficult for Google or anyone else to eavesdrop or record what you say. 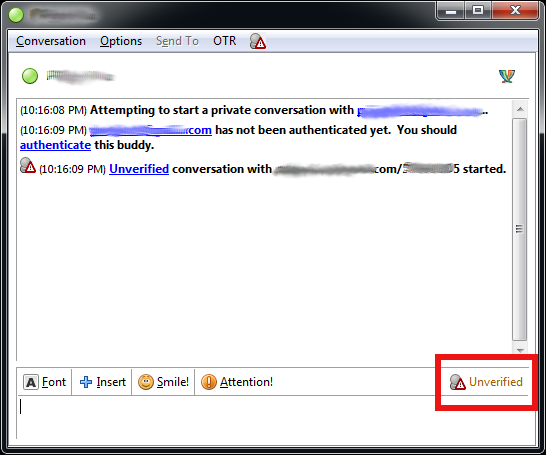 Just point your Google chat buddies to this page and get them using the OTR plugin! 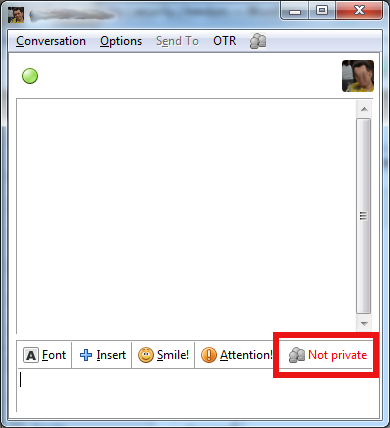 Note: You can communicate privately only if the chat buddy you’re communicating with has followed the above steps, or is using other software that uses the OTR plugin. 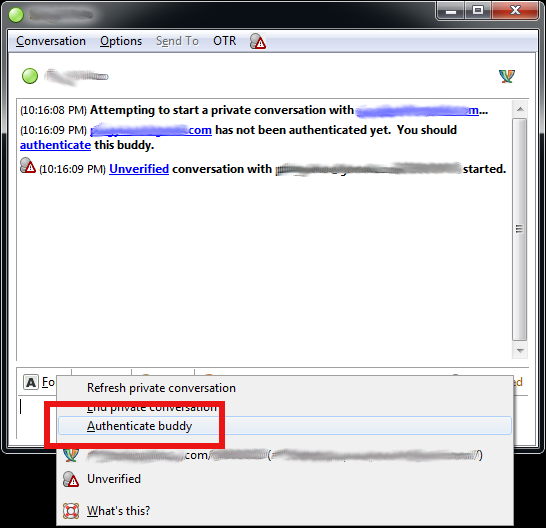 Double-click on a buddy’s name to bring up the Conversation window. Notice the “Not private” button on the bottom right? This means you have not activated the privacy features yet. But you’re about to! This is the result we want. “Unverified” is not a problem (but see Improvement 2 below). Pidgin tells us that it has established a secure channel to the other end, and you can use it to chat with your buddy without Google being able to read & record your messages. Remember to always check the bottom-right OTR status icon. If it says “not private”, you should assume that Google is recording everything you type in that window. You have stopped Google reading, analysing and recording what you discuss with your buddies. But if you have reason to believe someone might be trying to read what you say (e.g. if you’re a whistleblower, journalist, activist, lawyer, live in the wrong country etc) you can not yet be 100% certain that the person you are talking to, is indeed your buddy and not an impostor, pretending to be your buddy. To rule out this possibility you should always verify the people you chat with. You only need to do this once for every buddy you wish to chat with. Encrypted, but not authenticated. You are talking to someone through a protected channel, but you don’t know yet who that “someone” is. 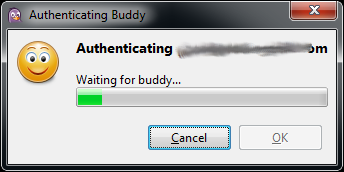 You are now presented with the easiest option to authenticate your buddy – asking them a question, and checking that they know the right answer. There are other methods as well, like entering a secret passphrase you have agreed on in advance. 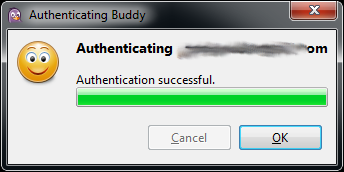 If you get a “Authentication failed” message instead, your friend probably mistyped something. Please remember (and remind your friend too!) that the answer is CaSe SenSiTive – so in this example the answer “Maxx” is correct, but “maxx” is wrong! Congratulations! You can now be confident you are talking to the right person! This is an additional benefit to what you achieved already – stopping Google (or anyone else) from monitoring & recording what you say! A private & authenticated conversation over Pidgin. You know the person you’re talking to is who they say they are, and you know that noone else can eavesdrop on your conversation. 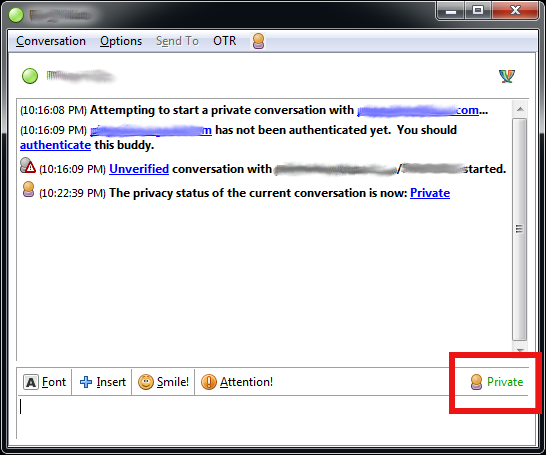 Next time you wish to talk to this person, you will just need to click on the OTR button on the bottom right and the conversation will immediately switch to “Private”. No need to re-authenticate, unless you or they are using a different computer. …which is a significant improvement from before. What, you still don’t like that? What are you doing chatting on Google Chat then?! Go use CryptoCat over Tor at http://xdtfje3c46d2dnjd.onion/, or if your enemies are pros (and you trust your hardware), TAILS. It’s a good idea to use Google two-step verification. This means that Google will ask you for two pieces of proof that you are the legitimate owner of your account whenever you log in from an unrecognised device. This is an improvement in security, but means that external applications (like Pidgin) can not access your Google account. Google’s solution is application-specific passwords. These are passwords that only work for one designated application and can not provide full access to your Google account (e.g. to change your account settings). See Getting started with Google 2-step verification and after you’ve activated it, create an application-specific password for Pidgin on your device. 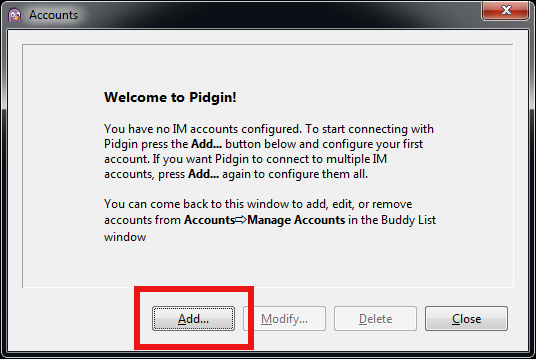 Then, on Pidgin’s main “Buddy List” window go to Accounts -> USERNAME@gmail.com -> Edit Account, input the password you just created, ask Pidgin to remember it, hit “Save” and you should be all done. Now starting Pidgin will automatically log you into Google Chat, without asking for your password.  I recently found out about Tor Cloud and think it’s a great idea. In a nutshell, you can strengthen the Tor network with a few clicks and a small amount of money paid to Amazon. But how much does it actually cost to run a Tor relay on Amazon’s EC2 service? Remember that there is a “free usage” tier – this probably explains the $0 running cost charged for my Tokyo instance. Maximum bang for the buck if you can’t spend money on this: Run only one instance, preferably in a high-traffic area like South America. Expect to spend less than $10 per month. Expect to spend approximately $20/month/instance if you’re running more than one instances. I’ll kill all instances but Sao Paulo and Tokyo – at the moment all other instances seem to be receiving so little traffic they’re not worth the hassle.